They have published three of the most talked about, and critically acclaimed, Irish novels of recent years - including the award winning Solar Bones by Mayo born, Galway based author Mike McCormack - but for Tramp Press’s Sarah Davis-Goff and Lisa Coen, there is still a lot to be done, and many attitudes still to be changed. Sarah and Lisa were in Galway last weekend for the city’s Cúirt International Festival of Literature where Tramp authors Sara Baume, Arja Kajermo, and Mike McCormack were reading. 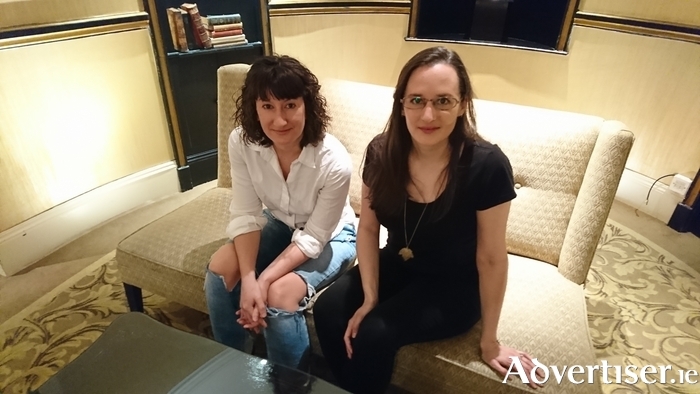 We met in the Hotel Meyrick on Sunday morning to talk about Mike McCormack’s success; the challenges of being a small, independent publisher; feminism and male attitudes to women’s writing. Its founders had several years of experience working in the publishing industry, but their reputation was made by their discovery of Sara Baume and publication of her debut novel, Spill Simmer Falter Wither, in 2015; reputation further enhanced with Mike McCormack’s Solar Bones last year, and Baume's second novel, A Line Made By Walking, another acclaimed work, published this year. Baume and McCormack's novels, alongside works by Donal Ryan and Eimear McBride, seemed to usher in a new era of imaginative, innovative, Irish fiction, whose experimentalism the reading public was willing to embrace. Galway, of course, was particularly proud of Mike [pictured below] when Solar Bones won the Bord Gáis Energy Book of the Year and the Goldsmiths Prize. The idea of certain kinds of writers, and writing, is being overlooked, was the key to Sarah and Lisa establishing Tramp Press - but there was as much an social and ideological motivation, as there was a literary one. 'We often think of women authors as being prominent in writing these days - whether that be Sara Baume [pictured above] winning awards, or Cecilia Ahern and Kathy Kelly storming up the best-sellers list - but if the Internet and Donald Trump have taught us anything, it’s that, not only has sexism never gone away, it’s received a whole new lease of virulent (indeed viral ) life - and literature and publishing are not immune to this. It’s a range of experiences which have made Tramp a “feminist press” - down to their title. Tramp is named after John Millington Synge’s “tramp” figure, the outsider who comes along to shake up the patriarchy. It is also an subversion of a word which has been used to insult women as a whole. Page generated in 0.0918 seconds.